When Pieta Brown was in town almost two months ago, she played her songs before a sold-out Midland Theater. As the opening act on Mark Knopfler’s tour, she had a dream gig of full houses and open-minded audiences. Opportunities like that can boost a career, but it doesn’t happen overnight. Which is why just seven weeks later, Brown was back. The material may have been the same, but without Knopfler’s boost, Brown had trouble drawing more than three dozen people to her early evening set Friday night at Crosstown Station. These are the roller coaster realities of an emerging artist, all too familiar to Brown. The daughter of folk singer Greg Brown, she released her first solo album in 2002. Her latest release dropped in April. On those albums Brown has crafted a sound that will please fans of Kathleen Edwards, Carrie Rodriguez and the Cowboy Junkies. As before, Brown arrived armed with guitarist Bo Ramsey, who not only produced several of her father’s albums, but has also worked with obvious influences Lucinda Williams, Ani DiFranco and Calexico. Brown’s songs provided ample space for his tasty, slow-as-molasses solos to drip out. 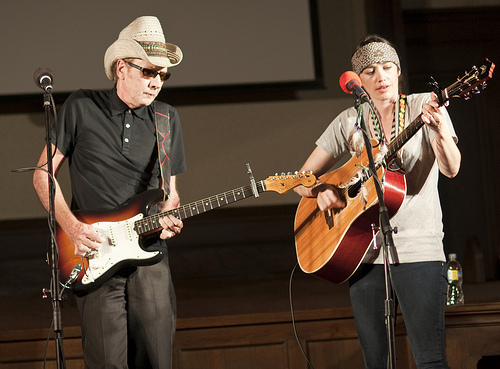 Above: Bo Ramsey, left, and Pieta Brown during a 2009 performance. The duo’s 75-minute set included several stand-out numbers, including “In My Mind I Was Talking To Loretta,” an homage to the time Brown’s parents took her to see “Coal Miner’s Daughter” and she came home wanting to be “Roletta Lynn.” The song is also a tribute to the run-down Iowa shack she grew up in surrounded by “miles and miles of haystacks and miles and miles of gravel roads,” as she told the crowd. The sparse crowd sat attentively, appreciative, but distant. It was the type of polite crowd that would wait until between songs to get up and head to the bathroom. No one thought, however, to stand up and move closer, which left a 15-foot chasm between the stage and the first row of tables. Although Brown’s material was strong, the similar moods and arrangements caused them to blend together after a while. Some of the audience started to get bored, as the chatter from the bar picked up until it threatened to overwhelm the last quarter of the set. For all of her considerable talents, Brown would be better off teaming up with similarly minded and situated artists. This would take the pressure off of having to sustain a full set, and broaden her reach. She would be a great addition to the July bill at Crossroads that includes Dar Williams and Rodriguez. Brown was long gone by the time Truckstop Honeymoon took the stage an hour later. The quartet not only had the benefit of a later time slot, but also a local following. After Hurricane Katrina washed out bass player Katie Euliss and guitar/banjo player Mike West’s New Orleans home, the couple relocated to Lawrence, Kan.
Augmented by mandolin player Jake Wagner and drummer Colin Mahoney, the pair traded and harmonized on verses like Johnny Cash and June Carter, refusing to take anything seriously. When Euliss sang about the Christmas she got her mama high it was hard to tell how much was she made up. Later, West introduced the original “My Automobile” as a P-Funk cover. The 90-minute set also included several new songs, like “Latch Key Kid Recipe Book,” an ode to absent parents and oven pizzas. “Kansas in the Spring” drew a parallel between tornadoes in the heartland and hurricanes on the coast. The best moment was “Vacation Bible School,” another song that felt autobiographical. After coaxing the crowd into singing along on the ridiculously convoluted chorus about getting kicked out of bible school, West broke the audience into three parts and held a yodeling competition.